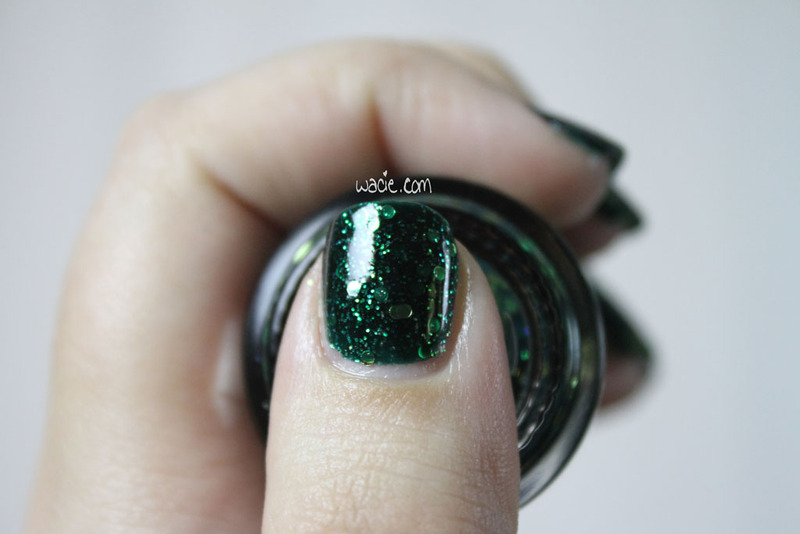 It’s Manicure Monday again, and I’m excited because it’s a wacie.com first: textured polish! I’ve been buying these up like mad, but this is the first time I’ve ever featured one on the blog. 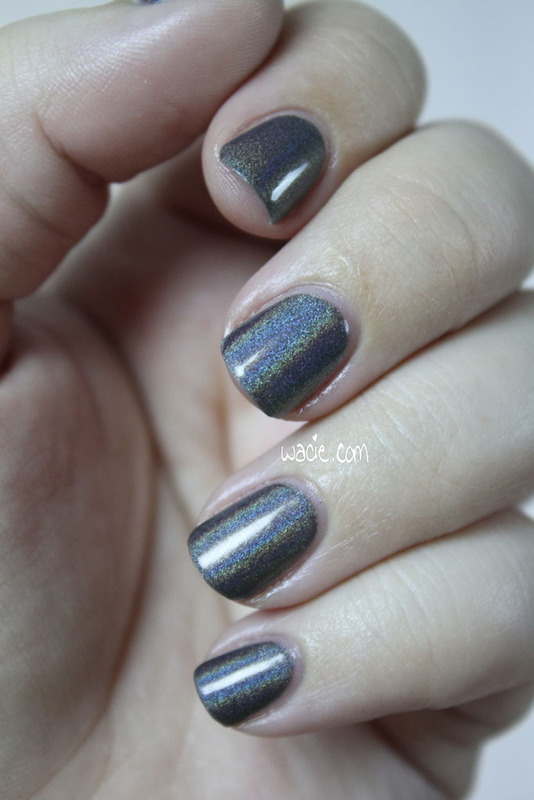 This is OPI’s Liquid Sand in Vesper; I’m wearing three coats of it without topcoat. 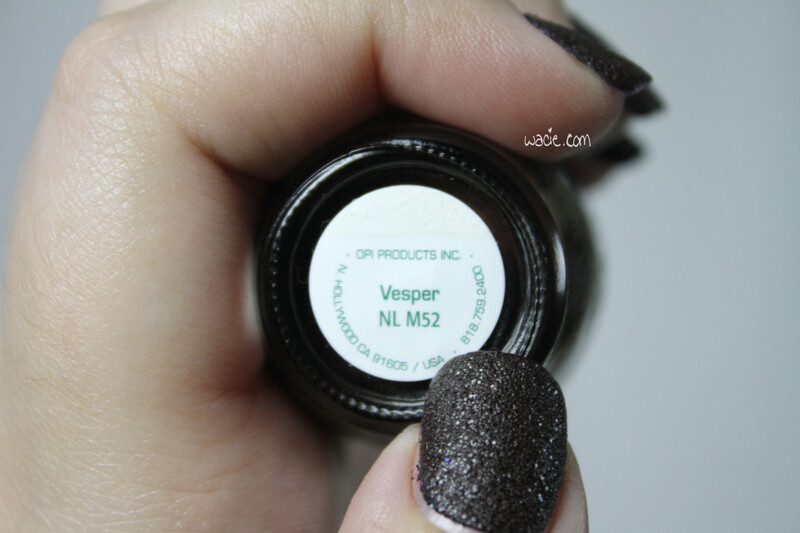 Vesper is a deep plum polish with black grainy glitter. You can’t see much of the purple, except around the edges of the nails. The first coat presented more purple, but multiple coats makes it harder to see. It dries with a coarse, gritty texture, as is intended. It sparkles a bit more in lower lighting; in the studio, it just kind of looks like spray-on truck bed liner. I couldn’t capture that in the studio. I probably could have in the sunlight, but I was late taking pictures today and it was pretty dusky by the time I got outside. This isn’t to say I don’t like this polish, because I do. Nothing says summer fun like a plum, right? However, it’s not my favorite Liquid Sand. 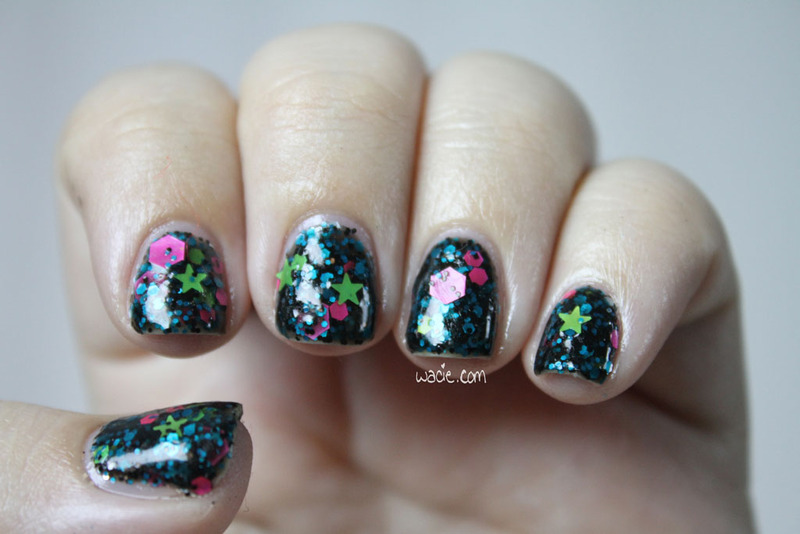 My favorites are still the ones with more emphasis on the glitter than on the texture. In any case, it’s a cool look, and I’m not sure if textured polishes are passe yet, but I’m happy to finally get around to reviewing one. Swatch Saturday is right on time this week! We’re on the second bottle of my most recent American Apparel haul. 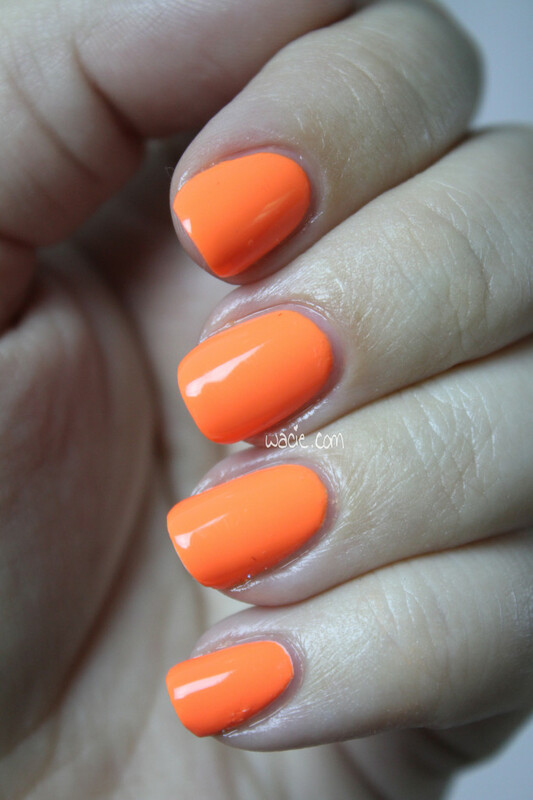 This is called Neon Coral, though I think it’s really more of an orange. 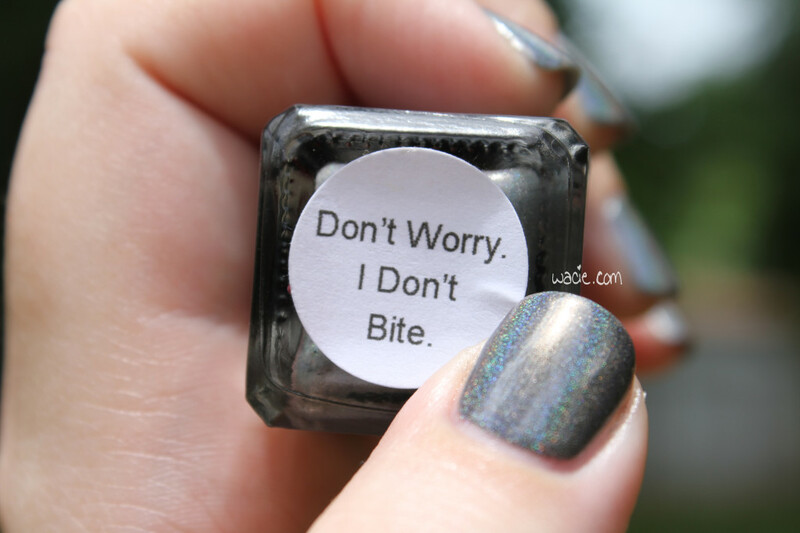 It’s the perfect polish to wear today, too; it’s 97 degrees outside and this polish looks the way the weather feels. 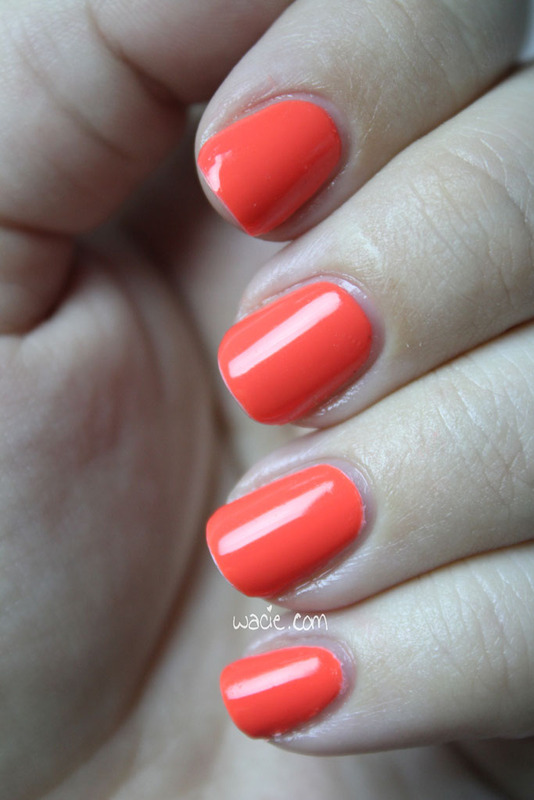 I’m wearing three coats of Neon Coral with one coat of Seche Vite. As with last week, the pinky and ring finger nails have two coats of white polish under the color. I am really into these neons! I am so glad I bought all the ones I didn’t have. The formula is a bit thin, but is still easy to work with and covers well. The color payoff is huge, even without the use of white polish. It’s so bright, my fingers look instantly tanner. It’s delicious. These neons absolutely cannot be beat. I find it interesting that the use of white polish makes such a small, almost undetectable, difference. 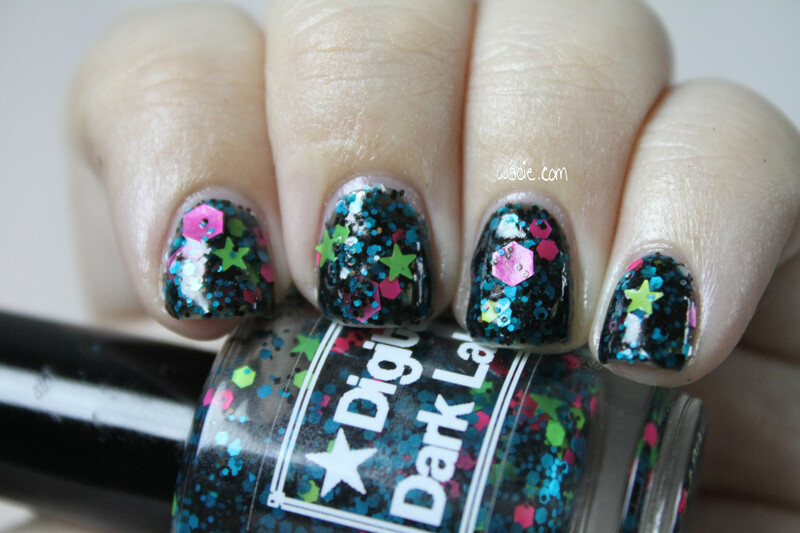 I’ll continue to do this with the rest of the neon polishes, just to see if it really is unnecessary. 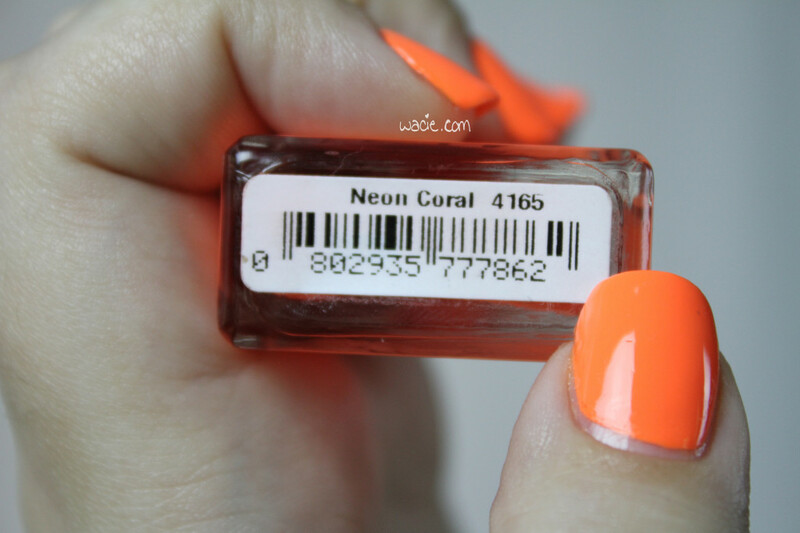 It seems like this was always the disadvantage to neon polishes; the colors are beautiful, but they don’t cover and require white polish. If all six of these manage to break that trend, I will be incredibly pleased. 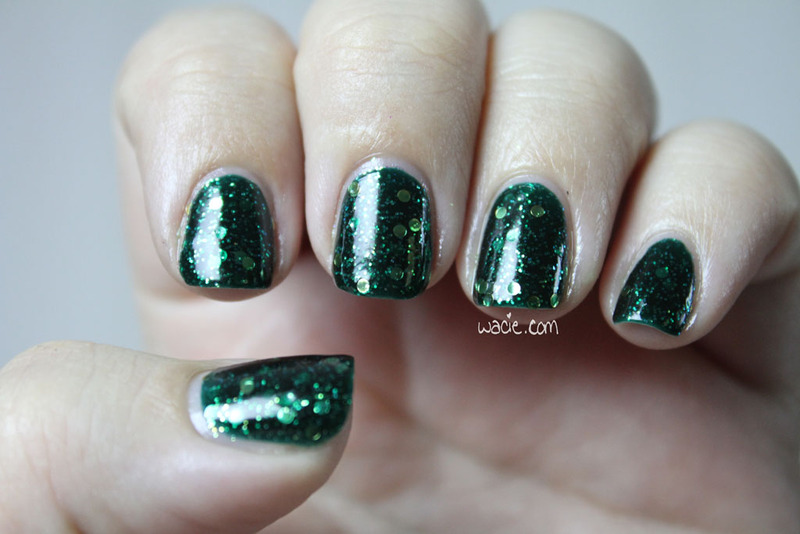 Manicure Monday is good this week. 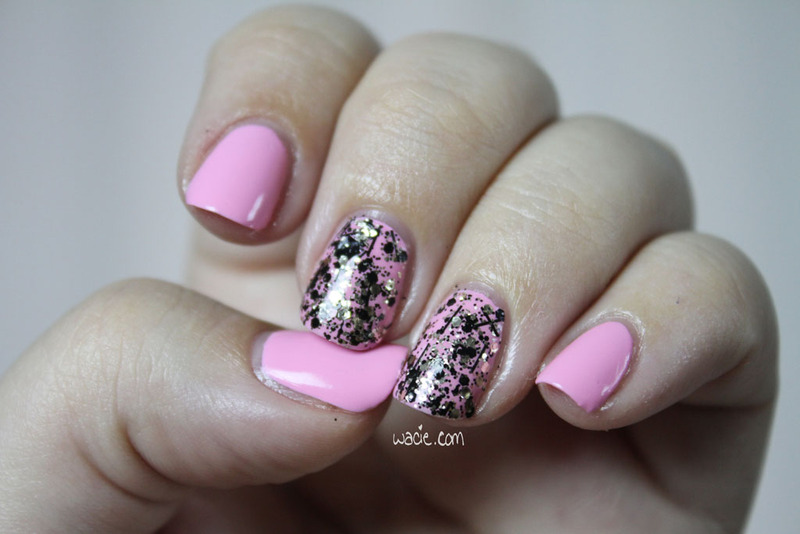 Everything I love is here: pink, glitter, shine; I couldn’t hate this if I wanted to. For this manicure, I’m wearing two coats of Julep’s Carrie with two coats of China Glaze’s Razzle Me Dazzle Me on my accent nails. 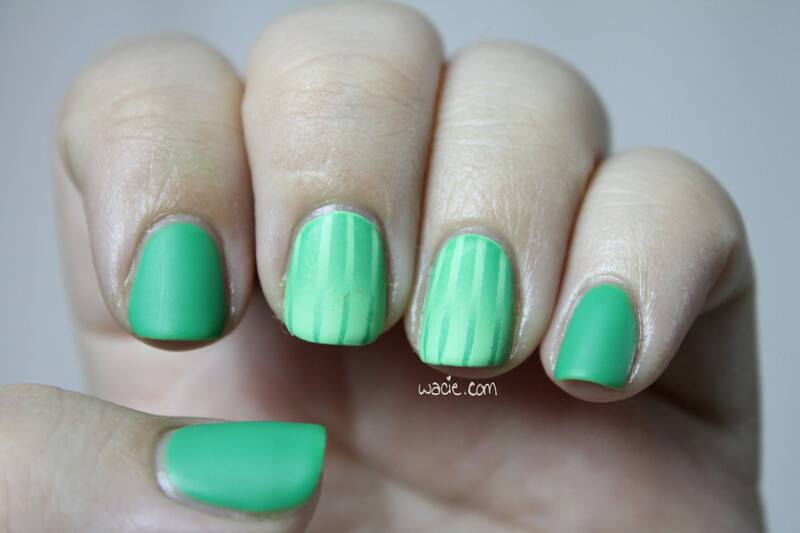 All nails are topped with one coat of Seche Vite. Carrie is a sweet candy pink creme. It’sa really nice polish, though I wish I’d gone with three coats instead of two. Consistent with my Julep experience, the first coat was streaky and thin, and while the second coat did a lot to even out the color, there are still some bald spots. Other than that, I like it a lot. I have no other complaints than the coverage. 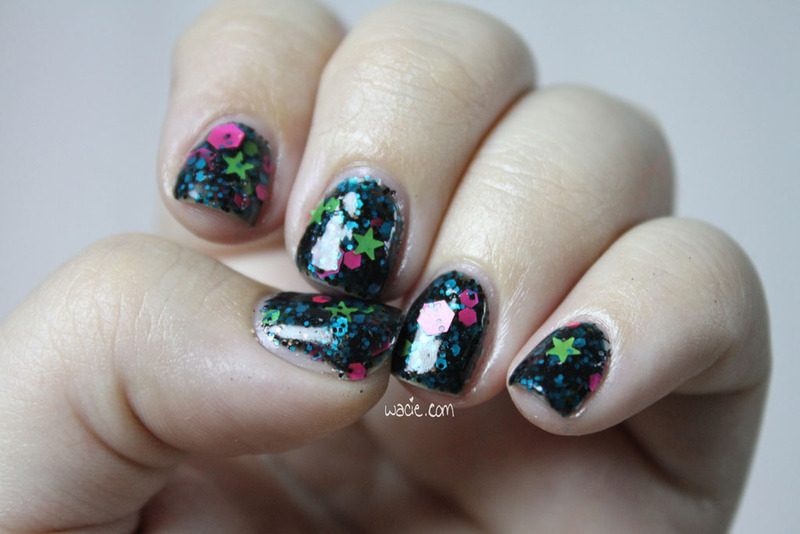 Razzle Me Dazzle Me is a graffiti-style glitter from China Glaze, filled with various shapes and sizes of black and pink glitters. At first, I didn’t notice the pink glitters were pink; they appear silver at first look, but are much rosier and smokier than silver. In any case, they give off a ton of shine. The black glitters are much more prominent, obviously, so much so that it overpowers the base color. I didn’t plan to use two coats of glitter, but the first coat was kind of lopsided, and I wanted to even it out. Mission accomplished, I guess. This is an outdoor shot. It was cloudy out there, so I didn’t get many good shots, but I wanted to show you this one because of how shiny the glitter is. See how it looks green? I was standing in front of a tree. And in the other photos where it looks gold? That’s my yellow shirt. 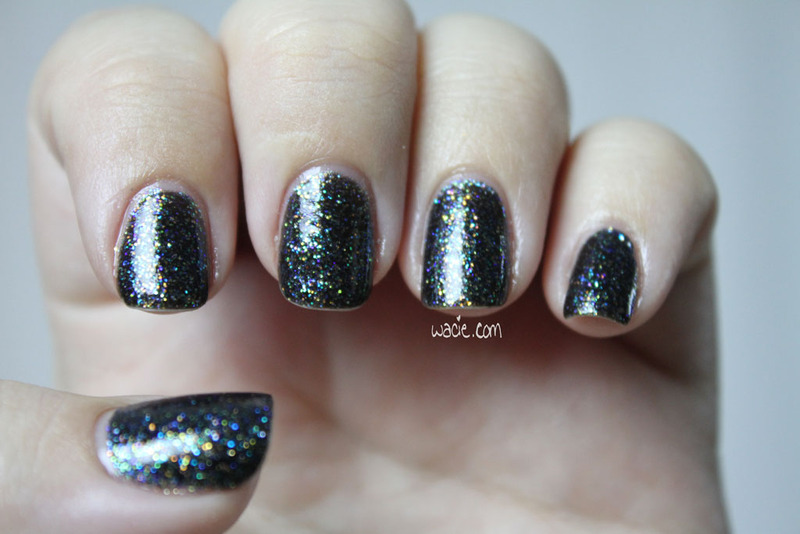 I love this manicure. I don’t wear pink polish often enough. 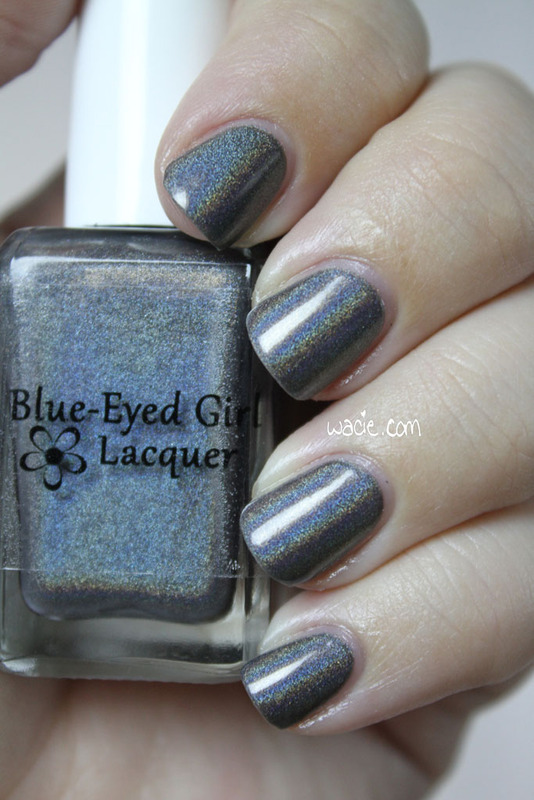 This week, I’m taking a break from swatching my Blue-Eyed Girl Lacquer collection to try a few I bought while I was on vacation. I had a habit of shopping at places just because I could; my city doesn’t have American Apparel stores, so when I saw one in Philadelphia, I had to stop in. The first time I’d ever been to one was on my birthday trip to Atlanta last year, and I bought six polishes, one of which was a gorgeous neon pink. 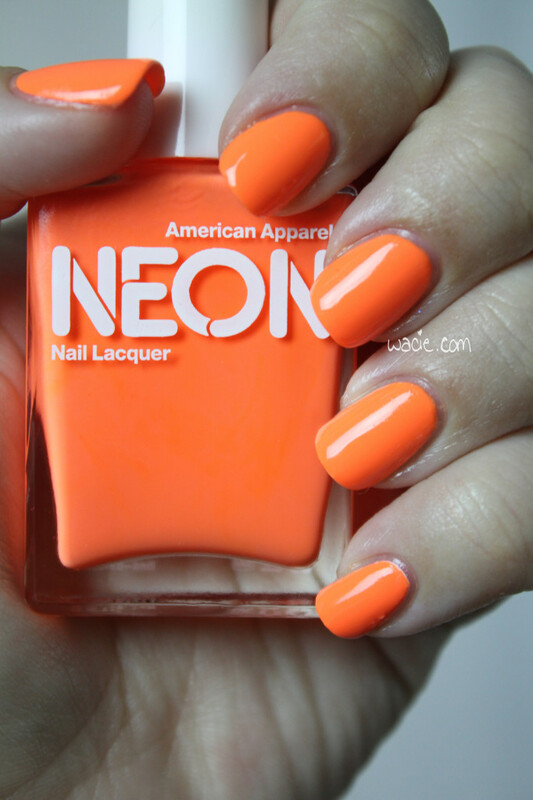 I was so impressed with it that I swore to myself, if I ever see another American Apparel store, I’m going to grab all the rest of their neon polishes. Well, here we are. Today I’m trying Neon Red. I’m wearing three coats with one coat of Seche Vite. 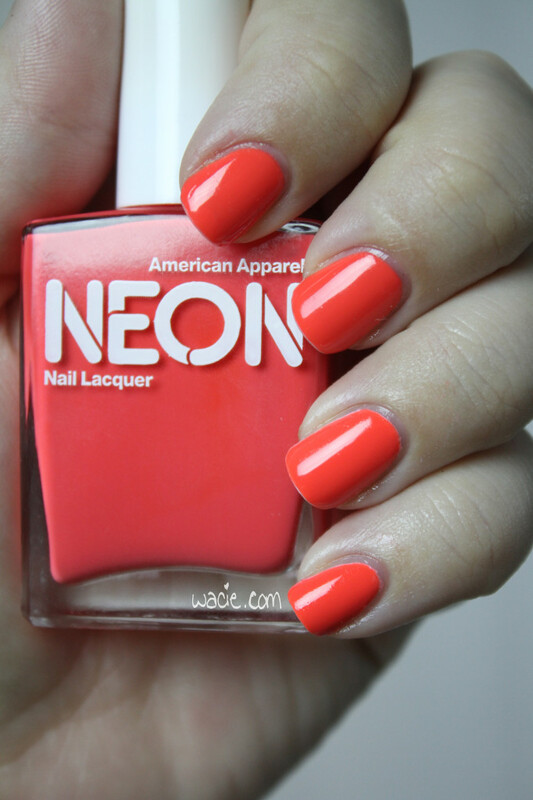 Neon Red isn’t really that red; it’s more of a bold coral. It’s a beautiful color, certainly. 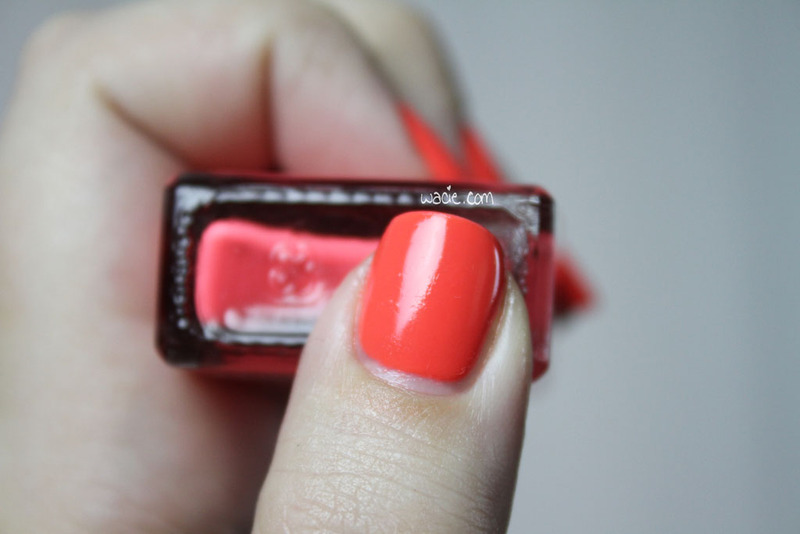 As I did when I reviewed Neon Pink, I put down a coat of white polish, to see how much of a difference it makes. If you look closely at the middle and ring finger nails, you’ll see there’s a very slight difference in color. On my ring and pinky finger nails, I’ve got the undies coat. On the first coat, there was quite a visible difference, but as I added the next coats, the coverage built up and narrowed the gap. I wouldn’t say the white foundation wasn’t a total waste; in some lighting conditions, I can still my nail line on the no-undies nails. The white gives it a little more solidity, even if the polish doesn’t really need the pop. I’m so happy I grabbed these. 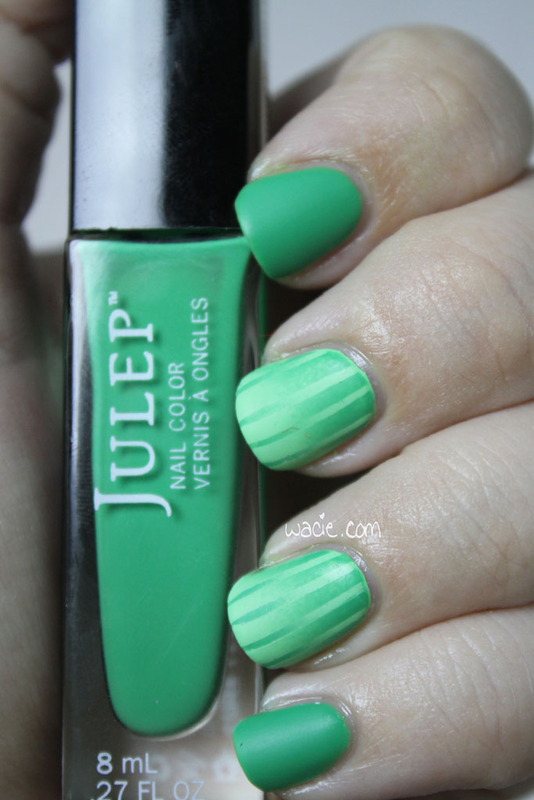 For neons, they’re pretty high-quality; you get great coverage and huge color payoff without a lot of white polish. I can’t wait to show you the rest! 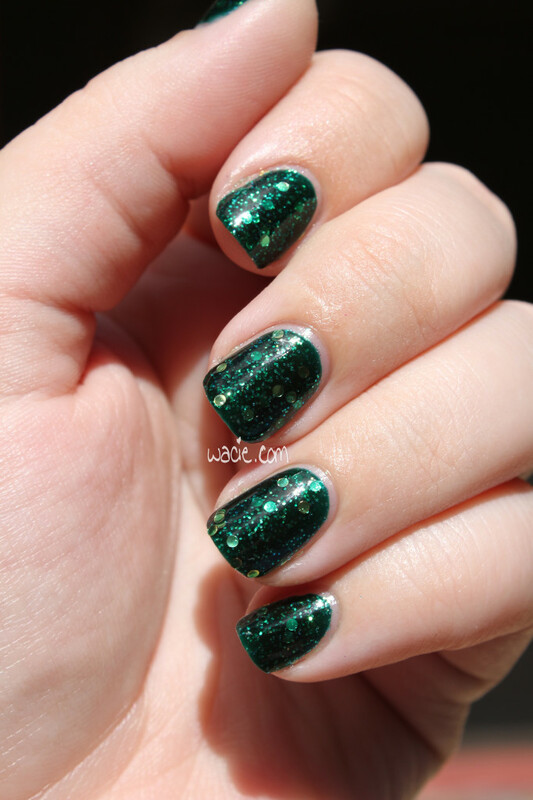 For this Wacie Wednesday, I submit to you Deep, an emerald green jelly with gold dots and tiny iridescent glitters. 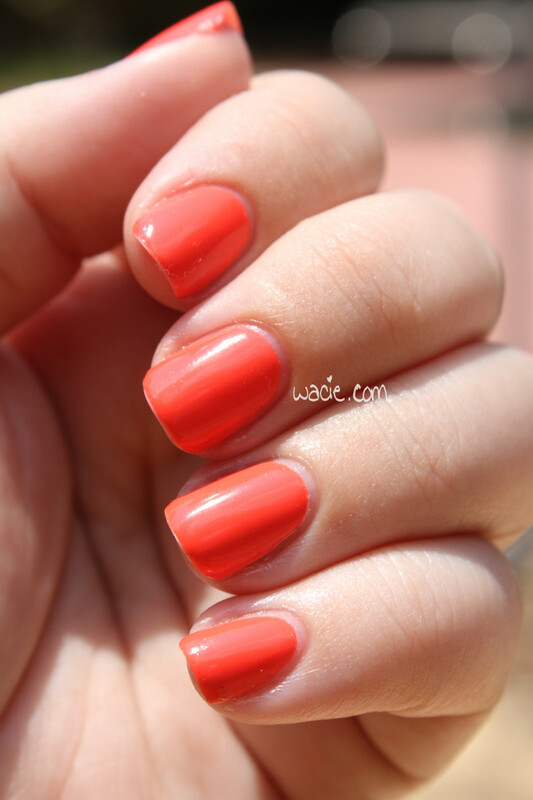 I am wearing three coats with one coat of Seche Vite top coat. As usual, photos were taken in an indoor studio and outside in sunlight. 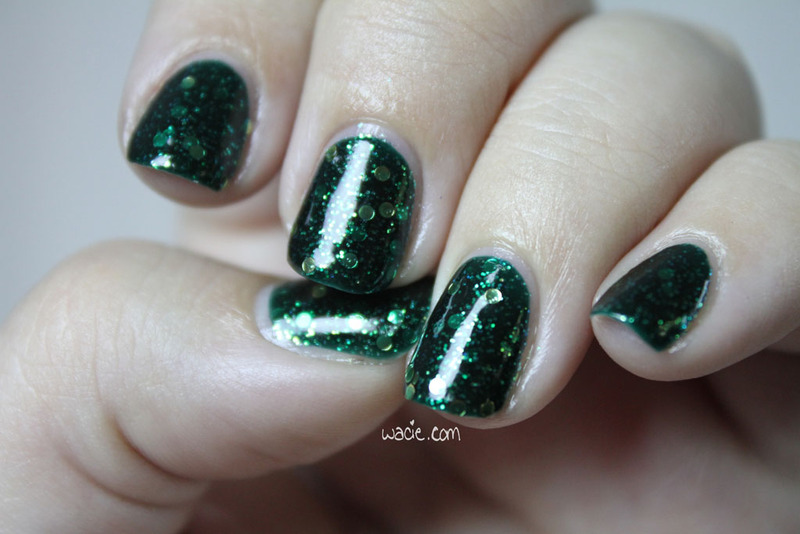 When I made this polish, I just felt like making something, and I was limited on supplies. I was between shipments, I was totally out of lacquer base and most glitters. All I had on hand was a small bottle of blue base, a bottle of yellow, and these two glitters. I thought “Why not?” and dumped a little of everything into a bottle. It was way too thick, but I liked how it looked, so when I got my next shipment of clear lacquer base, I diluted it until the formula was right (and made about five bottles in the process). 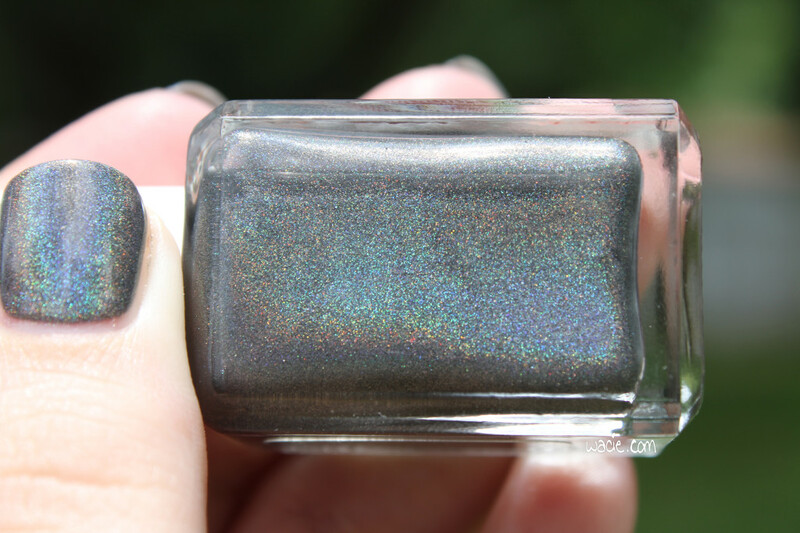 In fact, because this color is so dark, I wasn’t quite sure what I was going to get until I put it on today. I even added a little more clear base just to ensure that it would be a jelly. I’d like for it to be a little squishier, but I’m pretty happy with it. Because the color is so dark, I’m not sure how well it layers. 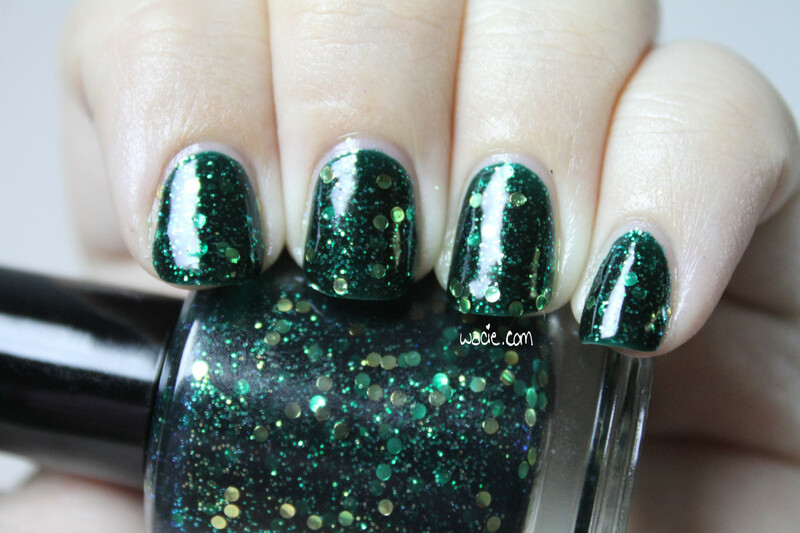 I’m not sure if I’m seeing three coats’ worth of glitter or just one. 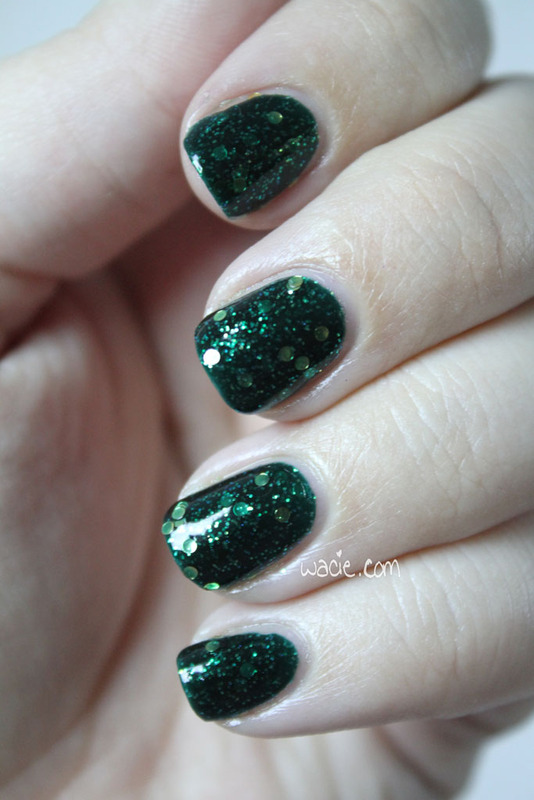 Also, the dot glitters are actually gold, and the color gets totally lost in the green base, even in the most recent coat. However, in the sun, you can see every speck of glitter the way it was meant to be seen. I freaking love this in the sun. It’s shiny as all get out. I haven’t mentioned the Wacie Nail Company launch in a while, I know. So far, everything is on track for a summer launch. I know I said spring, I know I said a lot of things. For real this time though: Wacie Nail Company is happening soon. Watch this space for updates. 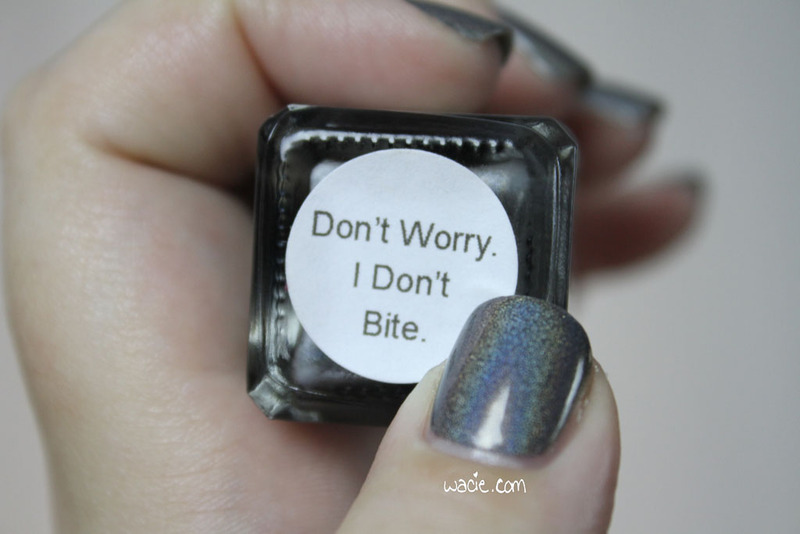 This Saturday, I’m wearing Don’t Worry, I Don’t Bite from Blue-Eyed Girl Lacquer. 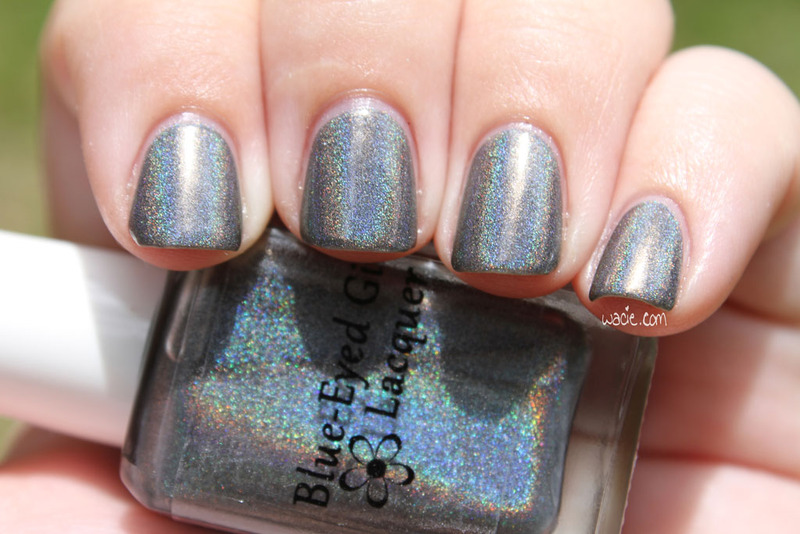 This is another beauty from the Once More With Feeling collection that was released last August. 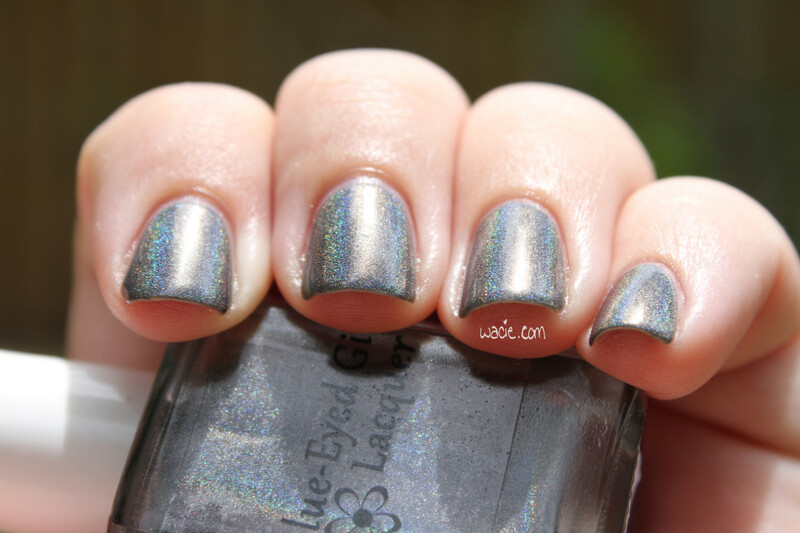 It’s a gray linear holo, shown here at three coats with one coat of Seche Vite. Photos were taken indoors and outdoors. Don’t Worry, I Don’t Bite is a gorgeous polish. It applies very easily, dries quickly, and the holo effect is vibrant and powerful, even in indoor lighting. The only thing I regret is that it’s mostly cloudy outside and my outdoor shots are not fantastic. I assure you, this is absolutely stunning in the sunlight, but right now it’s not very sunny at all. It’s disappointing. Sorry this post is kind of short. I feel like this polish speaks for itself. Also I have soccer to watch. Wacie Wednesday is happening on Thursday today because I really struggled with whether I wanted to post it or not. I’ve been developing this color, called Purity, for quite a while now, and I’ve just never been able to get it right. 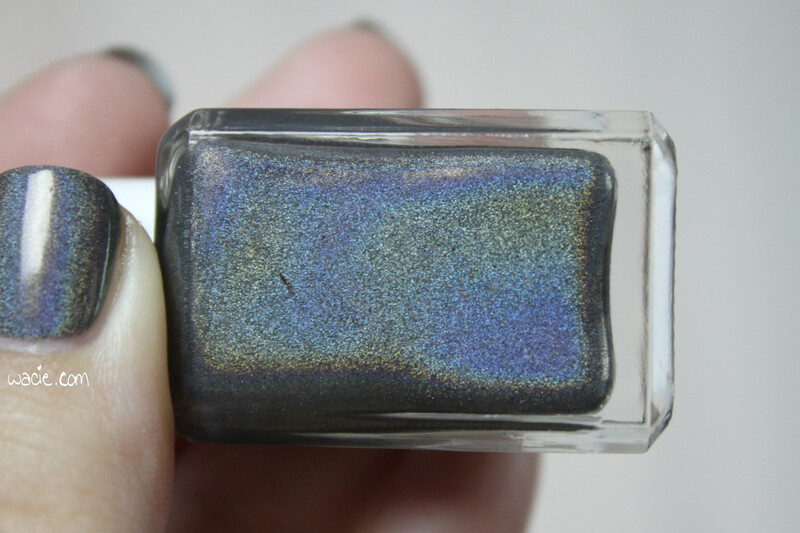 I can’t get the blue jelly squishy enough, and it dulls the larger holographic glitter. I didn’t want to post it this week because it’s still not right, but I like how it looks anyway, so I’m going for it. Also, I’m in this post-vacation funk where nothing is interesting, so I’m kind of doing this just because I need something to do. This is three coats of Purity with one coat of Seche Vite. 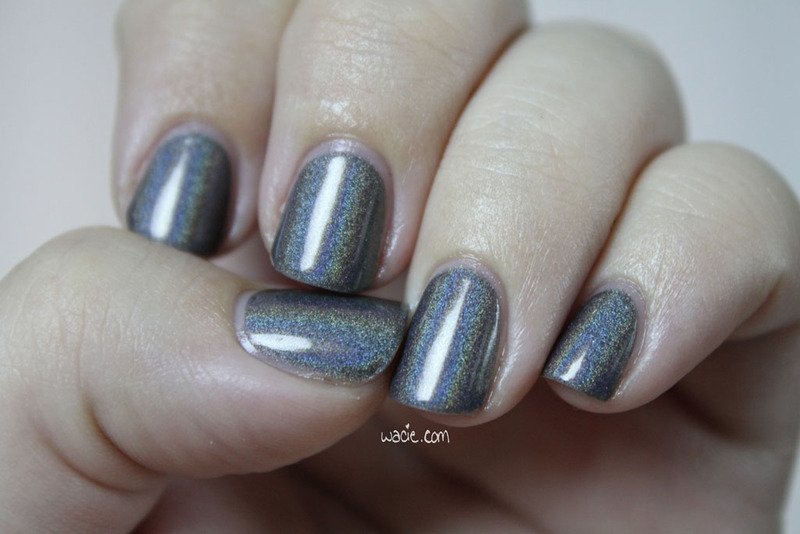 Purity is (or is meant to be) a blue jelly with holographic silver glitters. 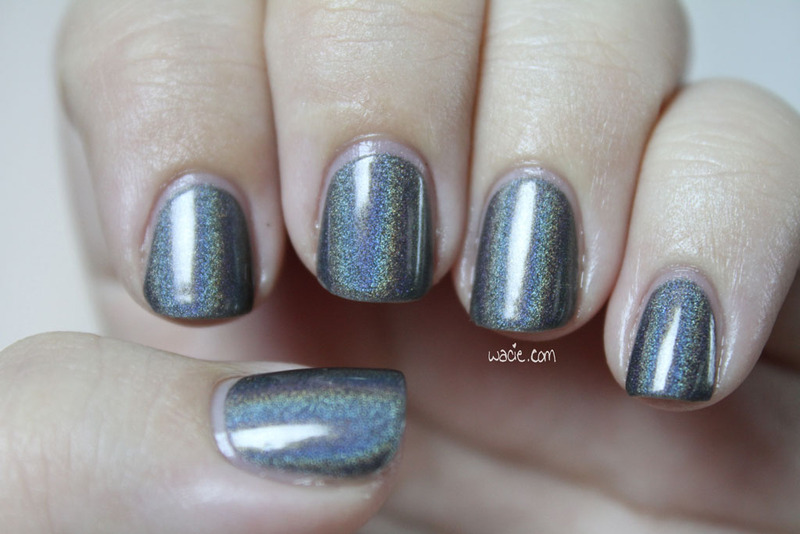 They’re a bit hard to see in the polish; the holographic effect tends not to show up too well in the studio, and the unintended crelly effect of the blue base dulls them. As a result, it just looks like a pretty but unremarkable blue. Not to say there’s anything wrong with that, it’s beautiful color in itself and I love how it looks on me. It’s just not what I was going for. See how it looks in the bottle? That’s what I want, and I’ve been trying like hell to get it. I just can’t make it work. It’s been cloudy and blah outside for a few days, so unfortunately, I couldn’t get any great photos in the sunlight. Sunlight usually saves my so-so glitter photos; couldn’t make that happen today. 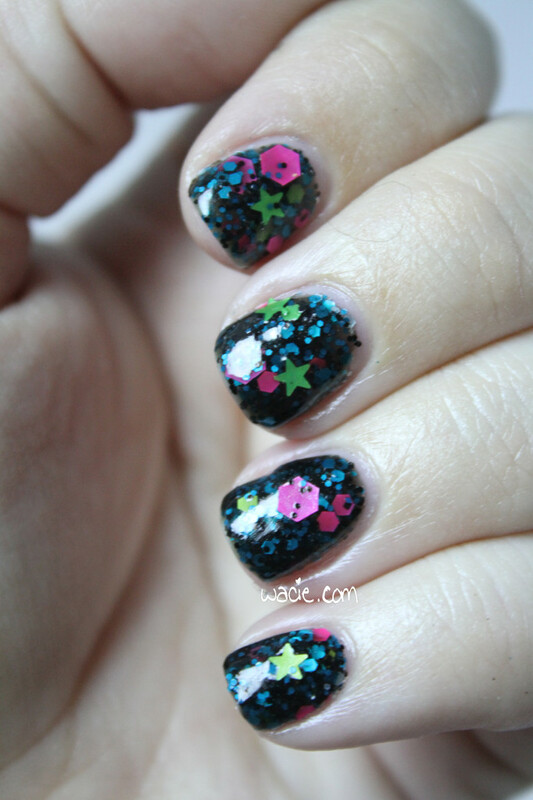 I actually took the studio shots last night, a few hours after I’d done the manicure. I took the outdoor shots this morning, but I just ended up getting great shots of sad cuticles. I’m a little embarrassed of these, actually. I love Purity, and I guess I’ll be taking it back to the workshop yet again for another reformulation. I love this polish. 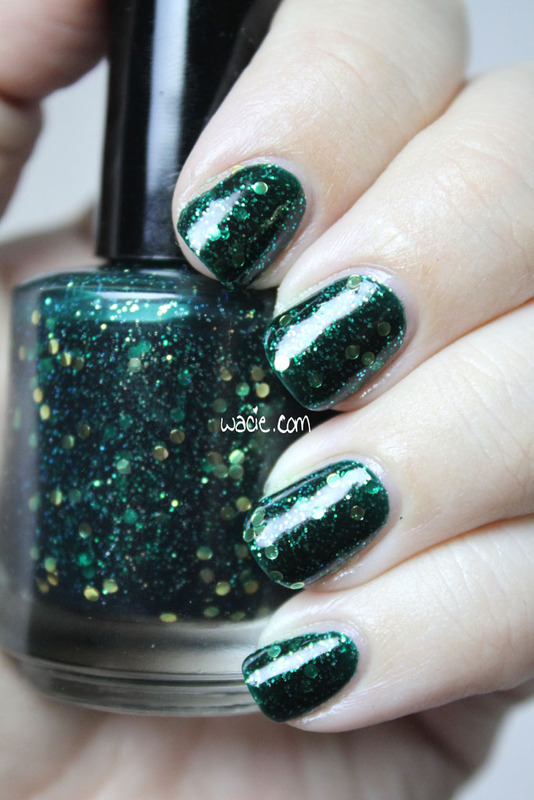 Even setting its concept aside, there is so much beauty in this polish. The neon colors and shapes jump right out at you, and only in certain lighting conditions can you see the darker ones. I was maybe a bit heavy-handed in my application; I’d hoped to see more of the black shapes through the jelly, but I really did obscure them quite well. I got such a great coverage that I forgot it’s a jelly base. It’s only when I see the few tiny black hexes scattered across the larger, brighter shapes I remember they’re there. This is likely true for many objects in space as well. 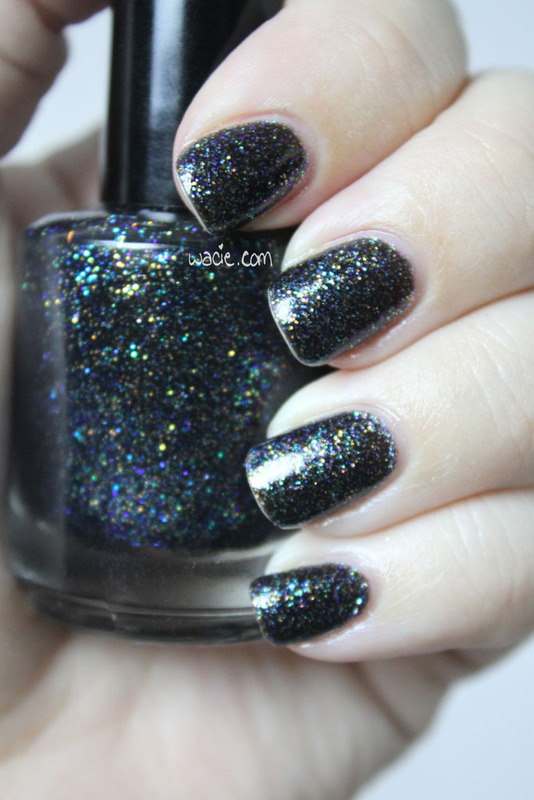 I know I say this a lot, but polishes like this are the reason I came to indies. 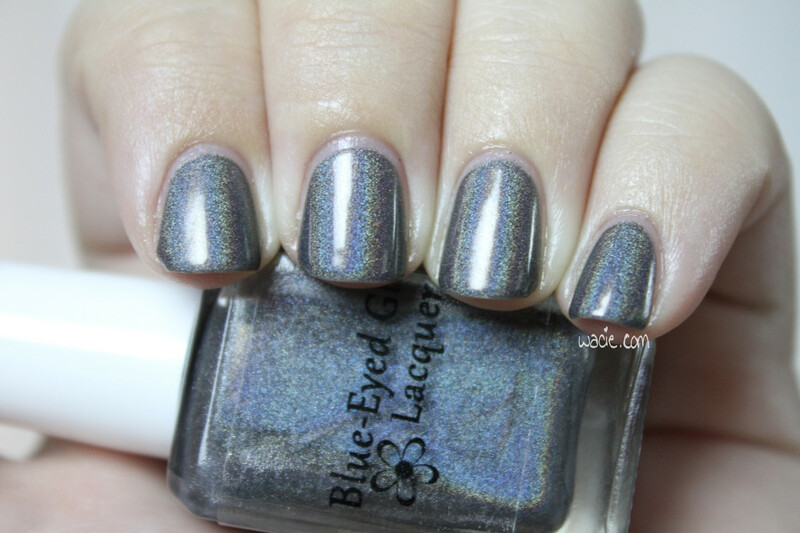 Here is a polish that’s not only gorgeous, but has something important and intelligent to say.